Profession­al roman blind maker with many years of experience in roman blinds. Roman blinds custom made to order at below factory prices. Throughout New Zealand. I can arrange for your blinds to be delivered right to your door step by courier. Contact me anytime by phone or email. My name is Lyn. I make beautiful roman blinds with a very high standard of workmanship. I would like to offer you my services on roman blind making. Get your roman blinds custom made at below factory prices. All you have to do is give me your window measurements. I will give you a quote and tell you how much fabric is required for your blinds. You can provide me with the fabric of your own choice and I will make beautiful roman blinds for your home or office at an affordable low price. The other option is, I can turn your old or ready made curtains into roman blinds. I supply all blind accessories, mounting brackets, quality blackout lining and making charge, which is included in the price. These blinds will have aluminium rods in each pleat for a more firmer look and a strong aluminium flat bar across the bottom of the blind and not TIMBER as it breaks very easily. They will be custom made for you professionally to your required measurements. All my blinds come ready to hang. The large mounting brackets shown in the photos are for my workroom only.This is used for me to hang and check my blinds before they are sent off. Every blind is supplied with the J mounting brackets,which are easy to install. This is fitted behind and under the timber headrail at the top of the blind, so you won't be able to see any brackets at all once they have been installed. Screws and a cleat is also provided. 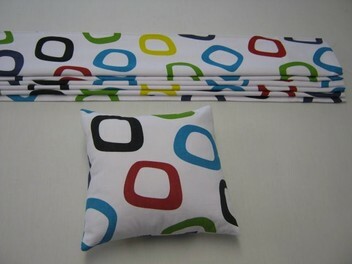 A custom made matching designer cushion cover or wall buntings for baby nursery room is made for FREE with your blind order out of the remaining fabric. All left over fabric will be sent back to you together with finished blind. Please Feel free to email anytime,if you have any qeustions or query about having your roman blinds custom made. Please read all GENUINE REVIEWS! Excellent communication and service. Absolutely delighted with the two Roman blinds and the bonus cushion. Thank you very much. I highly recommend this 5-star business provided by Lyn. Excellent communication with trader. Great blinds made quickly. Super quality. Lyn did a fabulous job remaking our old curtains into three new blinds with some quite tricky measurements. They fit perfectly and look superb. She even threw in some complementary cushions, which was a nice bonus. We are very happy with Lyn's work, she is easy to deal with and her fees are very reasonable. Highly recommended. Lyn was amazing and managed to still make my blinds beautiful even though I got the measurements wrong. She has matched the pattern perfectly and it is made to the highest standard. I love the with the black out lining she uses as it does its job well. I would give Lyn five stars and would recommend her services to anyone seeking to get Roman Blinds made. Lyn: Thank you, Alexandra - Auckland. The blind Lyn made is beautiful and fits perfectly. It was packaged very well and was ready within days of the order being made. I highly recommend Lyn. Awesome service. Top quality job and exceptional value. The bonus cushions were an added bonus, and very much appreciated. The blinds fitted perfectly! Thanks so much! Fabulous quality! Lyn made a beautiful job of very tricky fabric to match. Couldn't recommend her work highly enough. Lyn made two Romans blinds for us out of an old curtain. The blinds are excellently made. Lyn, you should be very proud of the high standard of your craft but also your exceptional customer service. Thank you so much for helping me with the process of getting the measurements correct on our tricky windows! I couldn't believe how fast you made such high quality product. We couldn't be happier with our blinds and will definitely be back if we need blinds in the future. Lyn did two roman blinds for us in velvet, which is a difficult fabric to use for blinds. They were perfect. We highly recommend Lyn. Thank you for a great job! Lyn made 3 blinds for me and I am extremely happy with the quality, craftsmanship and finish of the blinds. I would definitely consider using Lyn's services again and would highly recommend her to other customers. Thank you for a wonderful job Lyn, the blinds look great. We can highly recommend Lyn both for the quality of the blinds and the service she provided. She did a great job of custom making two roman blinds in velvet (which I know isn't the easiest fabric to work with) and we will definately be happy to work with her again. Thanks Lyn The blind looks fantastic, really pleased with it. Lyn made an impeccable job of the blind. Lyn made 5 blinds for us and they're all perfect! I had a complicated pattern for one of them and she worked it out and made the seam so well that you can't tell it's joined together. Lyn also made these blinds quickly for us as our baby was due which was much appreciated. I highly recommend Lyn. She is friendly and is a pro at making romans! Thanks again Lyn.